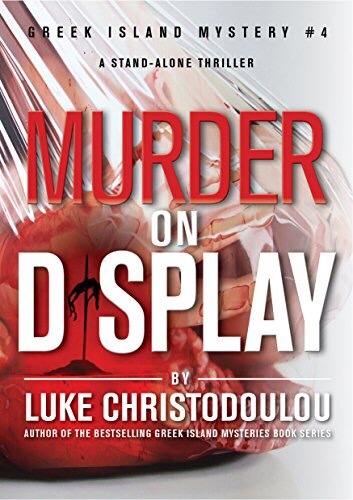 Murder on Display is the latest book by best selling writer Luke Christodoulou, and I choose it next in my Kindle Scout writer fest because it was released only a couple of days ago on Christmas Day to be exact. I’ve invited Luke along with the same questions – it will be interesting where and how he differs to Greg’s answers. Just go for it. Doubt is a killer. Dive in and keep going until you have a finished novel staring back at you! I normally get an idea creep out of the corners of my mind and it sticks around until it drives me crazy. As a mystery author I always plan the ending (twist, killer) as to be able to plant clues along the way. My strong female lead, named after my daughter. The Cretan, food-loving, foul-mouth Ioli Cara. I give myself a year for each book. I finish earlier than that though, giving plenty of time for the book to go to my editor and for my proofreaders to provide feedback. My books are always set upon the Greek Isles (thus the title of the series, GREEK ISLAND MYSTERIES). I prefer to write about islands that I have visited, though I have researched and googled locations I haven’t been to before. Always at my desk, always deadly quiet and always with a coffee. Hot during the few winter months and Greek frappe during the nine month summer. And then there were none. The mother of my genre, an absolute delight!